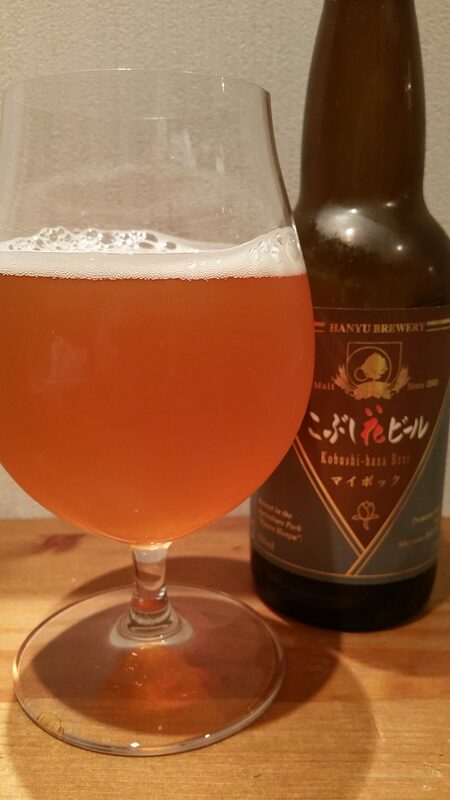 Kobushi Hana Maibock is a 7% maibock style from Hanyu Brewery, based in Saitama, Japan. It’s part of their all-year round range of beers and can be found in both bottles and on tap. Kobushi Hana Maibock is sometimes labelled as hellesbock, which is German for “light bock”, due its colour. At the time of writing, Kobushi Hana Maibock is brewed with imported German malts and hops. Maibock – DON’T TOUCH IT!! “Ooh that looks nice” said someone close to me. “It’s a maibock – never had one before in Japan” I retort knowing that someone is hankering for a bit of this beer. “Can I try some?” comes next. Not unexpected but still credit is due for trying. And that is the story of a how beer got me sleeping on my own. Not a drinking session, or me stumbling home drunk and making noise, or not me drinking someone else’s beer – a very bad joke. Kobushi Hana Maibock did pour out a very nice colour – a hazy dark golden orange colour with a reasonable amount of bubbles on top but nothing significant to write about, nor did it stick around for long either. It did have a rich caramel malty aroma with some fruity raisin and honey notes to it along with a stench of booze when Kobushi Hana Maibock had warmed up in my hands. If you were looking to give the smell of an old drunken man, then Kobushi Hana Maibock would be a brilliant suggestion. I imagine that honey dipped raisins would be a great snack but in liquified form, I can’t imagine someone wanting to drink more than a couple of spoonfuls of them. And that’s how I think of Kobushi Hana Maibock. It’s sweet from start to finish, with the booziness kicking in less than halfway through drinking. I wish I had given some of this beer away now as I really struggled to finish it off – Kobushi Hana Maibock didn’t taste bad but so much sweetness in such a short amount of time is not really a good thing. If you like sweet beers, then go and buy Kobushi Hana Maibock. Else, go buy a small jar of honey and make some mead out of it and save some cash.